Gov. 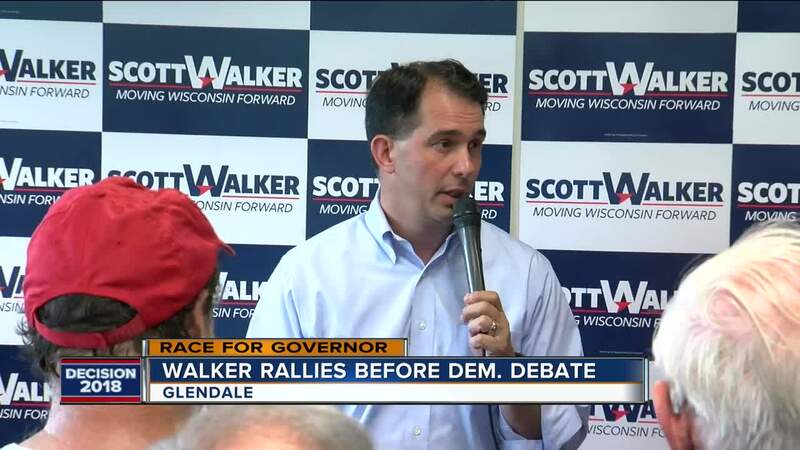 Scott Walker attended a rally Thursday night in Glendale, ahead of the first televised debate for the Democratic gubernatorial candidates. He stressed that even though he's running for a fourth time, it won't be an easy race. He said he thinks the Democratic side is angry and he wants to counter that with optimism and organization. He met with supporters at the Milwaukee field office of the Republican Party of Wisconsin, telling them this will be his toughest election yet. "I think things are good in this state," said Walker. "More people are working, property taxes are down, schools have more money, more extra dollars, a lot of people take it for granted." He also shared his plans if re-elected for another term, saying he will focus on making Wisconsin a great state for both retirees and millennials. "Overriding strategy is to try and figure out how to keep more of our graduates here in the state," he said. "How do we do more to attract even more millennials." He says Foxconn is one of the ways he thinks Wisconsin will attract the younger generation. "I actually think it's a positive thing," he said. "For years, Democrats have talked about good paying, family supporting jobs. We're now bringing 13,000 good paying, family supporting jobs into the state."